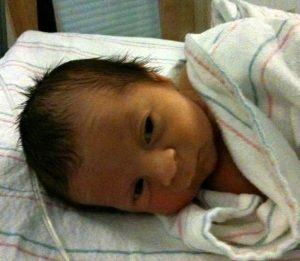 When Matthew was born and for a couple years subsequently we wrote a lot about his struggle through 3 heart surgeries. Here’s a snapshot of Matthew now, after he came to stay with me last night. 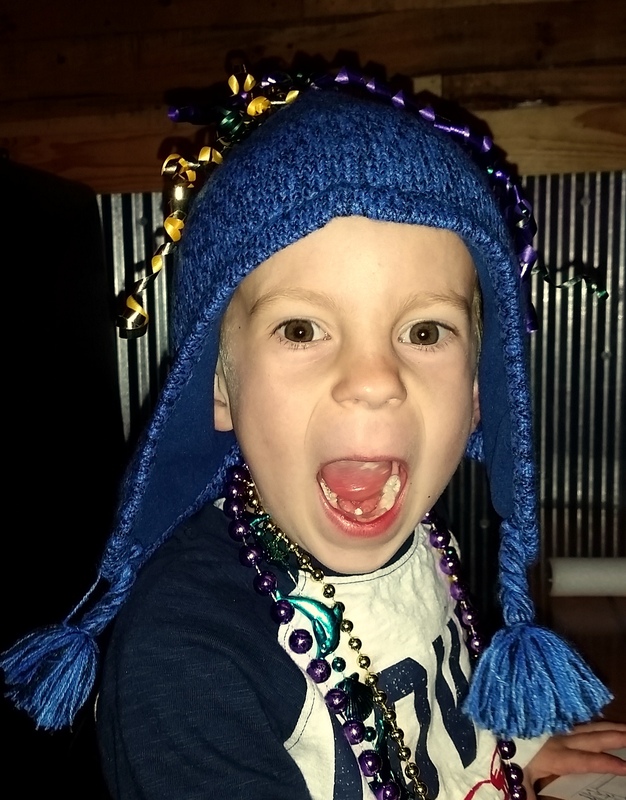 We took him to a Mardi Gras parade in Orange Beach, AL – which is as tame as parades get and so perfect for kids (and snow birds, apparently!). This little guy is so awesome. 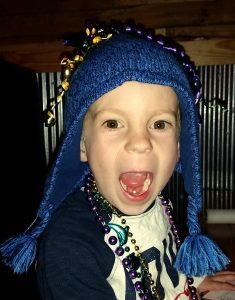 He walked around waving, smiling and announcing “Happy Mardi Gras!” to everyone he passed. To the ladies he’d announce: “Happy Valentine’s Day!” Then at one point he looked me right in the eyes and said: “You are special!” After a positive reaction from me he added this to his repertoire for others. It was fascinating to watch as people just melted before him, in the presence of his big smile and endless exuberance. It was a bit like watching a crowd do “the wave” as we walked down the street. People standing, staring, lost in thought, concern and worries about whatever, waiting for a parade to pass before them and throw some trinkets. Then out of nowhere comes this sweet little voice, drifting into their ears spreading well-wishes and you could watch it move, like it was a tangible thing – recognition of something different, heads turning as they seek to identify the source, involuntary smiles lighting up their faces as they are pulled unwittingly into “the now” by this gregarious 4 year old. Without time to think about it, they do their best to engage him, not realizing what they want is to hold on to this feeling, this moment, when this little guy reached into their heart and effortlessly squeezed a little love from it, and then replaced it with pure joy, the joy that is simply – being human, and seeing in that sweet face, all the goodness that is in you reflected right back for you to clearly see. For a kid born with half a heart, he certainly has mastered the art of stealing them from others everywhere he goes. On this day of love, it’s worth noting the half of his heart that functions is bigger and more full than most of ours with both sides functioning. We are so blessed to have this child in our lives. Matthew – YOU, my little buddy, are SPECIAL! Happy Valentine’s Day! As anyone with a CHD child in their life knows, good news is always fully embraced, while the fear of new potential health risks and dangers lurk, never far from conscious thought. In the McClurg family however, we have come to expect bad news to be but a wrinkle in our day, from which we gather ourselves, do what needs to be done, and move forward. Author JenniferPosted on December 31, 2010 December 31, 2010 Categories health and wellness, PersonalTags breast cancer, CHD, HLHS, kidney cancer, Matthew McClurg, positive self-talkLeave a comment on Tragedy? What Tragedy?